A non-drying formula that cleanses and refreshes without irritating sensitive scalps. Sensitive scalps need gentle yet effective care and a purely natural shampoo that cleanses without chemicals and toxins that can irritate the scalp. 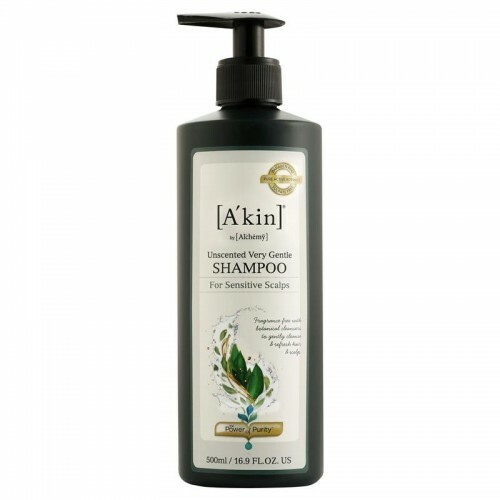 The A'kin by Al’chemy Unscented Very Gentle Shampoo is fragrance free and has 6 powerful yet gentle botanical cleansers as we have found that using a small amount of a few cleansers can be far less irritating than using just one or two. blended in a pH neutral unscented formula to calm and soothe a sensitive scalp. The result is naturally beautiful hair without the irritation. Follow with the A'kin Unscented Very Gentle Conditioner for sensitive scalps. Glycerin*, Glyceryl Laurate*, Sorbitol#, Sucrose Cocoate*, Citric Acid*, Sodium Citrate*, Sodium Cocoyl Glutamate*, Sodium Gluconate#, Sodium Hydroxymethylglycinate. Massage a small amount into wet hair. Rinse & reapply if necessary. Follow with A'kin Unscented Very Gentle Conditioner.